Tonight, in LA, Game 6 of the World Series begins. If it's anything like the last few, we're probably going to be watching until 6 AM ET. I can't even begin to describe how insane this series is, but...to be honest, these are the two best teams in baseball. So it's kind of expected that they keep ping-ponging back and forth for all 10+ innings every time. One moment Yasiel Puig's hitting a home run, the next minute Brian McCann's responding with another one. The pitching has been exemplary, the lineups have been ferocious. The only weakness has been the Dodgers' bullpen, and that keeps doing them in every time. But you can never count out the Dodgers. 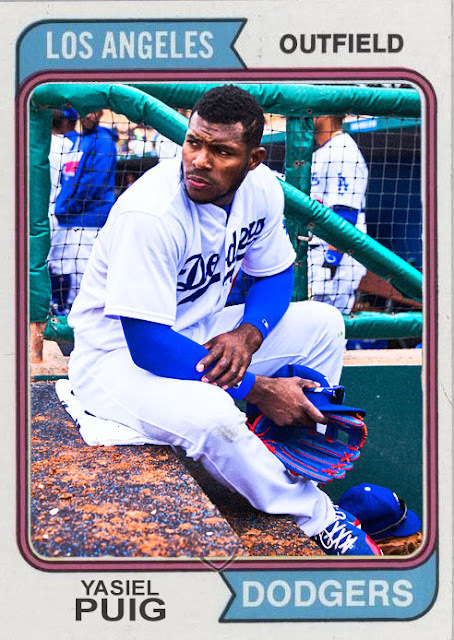 Not with Enrique Hernandez on the bench and Yasiel Puig waiting on deck. Plus, tonight they'll be starting Rich Hill, and he's been fairly awesome at keeping down surging offenses lately...but tonight could be his breaking point. It could honestly go either way, but...I'm expecting something truly scary to happen tonight in Game 6. Remember back in April when we thought this guy would have a disappointing season? Now it's October and he's just put his team ahead of the Dodgers at home. He, McCullers, Altuve and Gattis were having great nights last night, especially considering that the bulk of the work was at the expense of the still-failing Dodgers bullpen. Tonight, they'll have to contend against consistently-strong Alex Wood, which could be tricky for them, but with what they've done under pressure (like Yu Darvish), I'm not terribly worried. We're two games in, and already I'm getting some serious 'one for the ages' vibes from this World Series. Maybe it's the pitching, that can stymie teams for 6 innings. Maybe it's the defense, that make leaping catches and keep the score even. 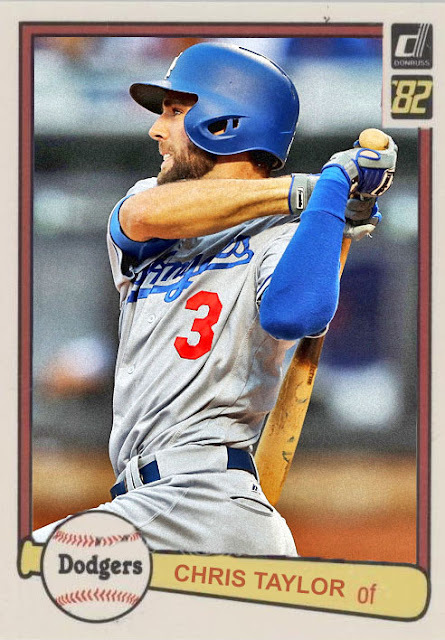 Maybe it's the excessive amounts of overpowered hitters, leading to an 8-home run game last time (thanks mainly in part to Yasiel Puig). Maybe it's the fact that, for the first time in a while, these are, in fact, the two best teams in baseball getting to match up against each other, and the results may have one of the most evenly-matched world series' in years. Either way, it's exciting as all hell. I say this mainly because I have no idea who's going to win, even after 2 games. It could be either of them. It could be the Dodgers and their wealth of great hitters and young stars, or it could be the Astros and their speed, force and endurance. Carlos Correa and Jose Altuve are playing like royalty, while Clayton Kershaw and Yasiel Puig are fighting furiously. And the games have been insanely fun to watch. Tonight's matchup is Yu Darvish vs. Lance McCullers. I have no doubt in my mind that it'll be a truly great one. I broke the rack packs over the weekend, and never got around to the hanger box. Well, on the day of the beginning of the WORLD SERIES...let's dig into this thing..
32-Luis Torrens, one of the Padres' rule-5 callups that...sank quickly. 267- Jhoulys Chacin, who had a better season as the ace of a pitiful Padres team. 283- Adam Eaton. 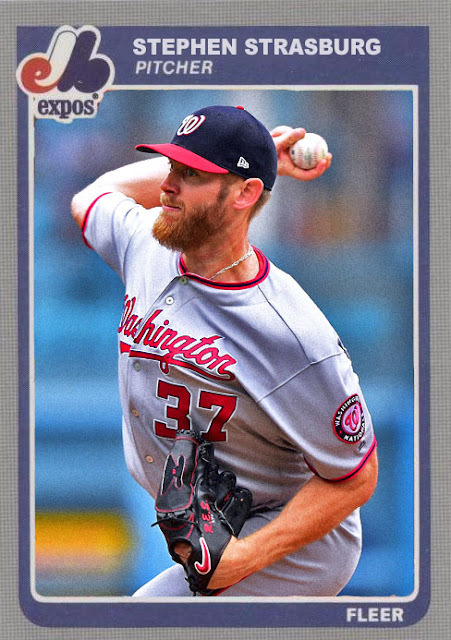 I imagine he'll be fantastic with the Nats in a full season next year, though he'll be turning 30 next season...which is kind of alarming. 6- Ramon Torres. Again, thanks to the early print date, ton of rookies that didn't really factor into this season. 219- Paul DeJong, finally a relevant rookie from 2017. 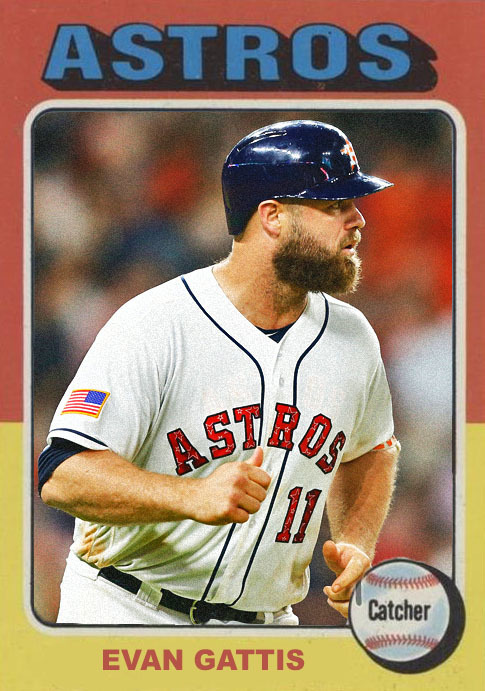 13- Brian McCann, finally someone playing in the World Series this year. A bunch of duplicates from Saturday's. Postseason Celebrations of the Mets. 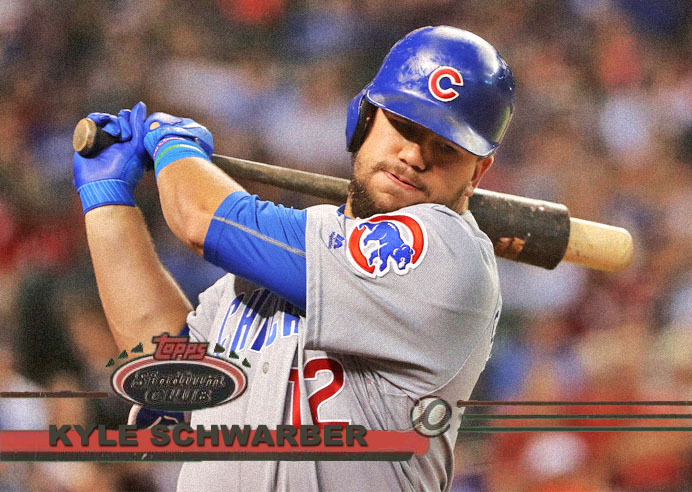 2015 WS theme with those inserts. 84- Michael Brantley AS. A shame he still can't stay healthy. 291- Andrew Miller AS. I'll give credit, once again, for whoever's been doing the AS photo selection for this set. I kinda hope it's the same person who was doing it a few years ago. 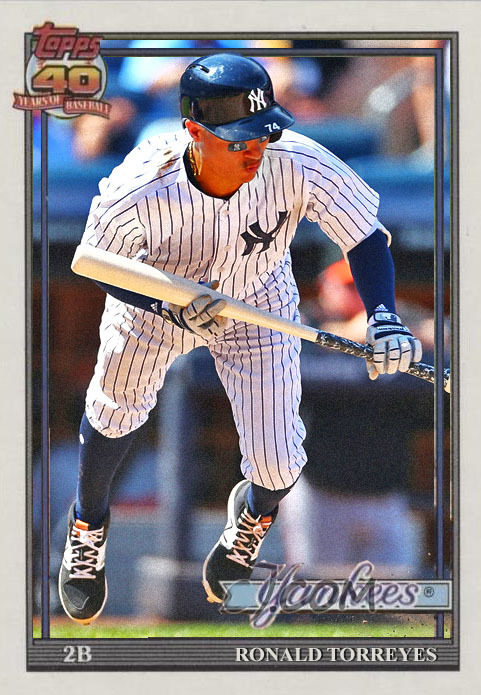 166- Aaron Judge AS. And, as an added bonus, more Judge. 175- Jose Altuve AS. Soon to be a World Series hero? 154- Franklin Gutierrez. Okay, a Dodger...but one that's not really on the team anymore. 148- Judge and Bird combo. Nice. 40- Pat Neshek as a Phillie. Well, at least this exists. 68- Jered Weaver, in his last card, as a Padre. 229- Tyson Ross, who was...alright this year. Not great. 70- Josh Reddick AS, there's ANOTHER one for the Series..
270- ....DON MATTINGLY VARIATION SP. 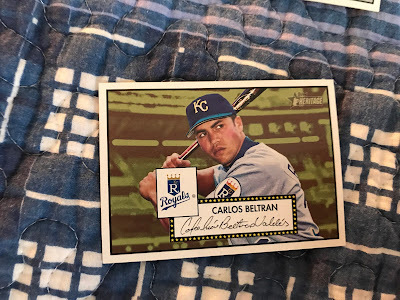 That is pretty nice, especially after the Gehrig one I pulled this weekend. Great photo, too. 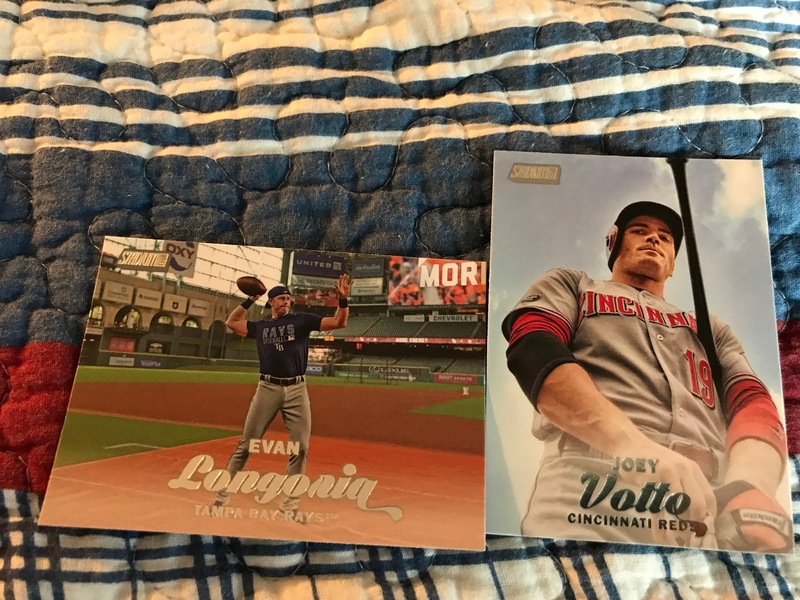 297- Two Astros rookies combo. 195- Fernando Rodney. Glad he had a nice enough season in Phoenix. 114- Pat Neshek AS. Cool, now I've got both of them. 100- CHRIS SALE. Okay, at least they actually made a card of him as a Red Sock. That I'm fine with. 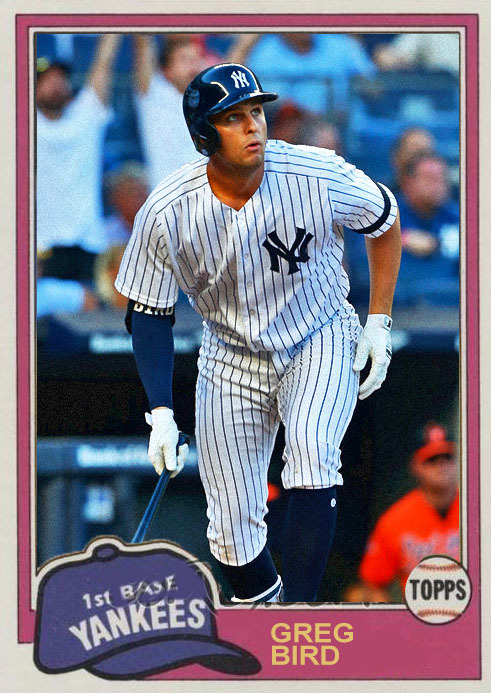 99- Aaron Judge RD. Okay then. 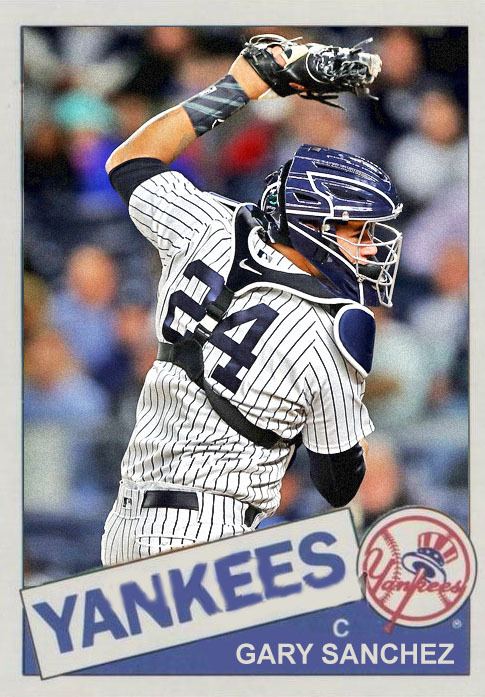 270- Gary Sanchez AS. 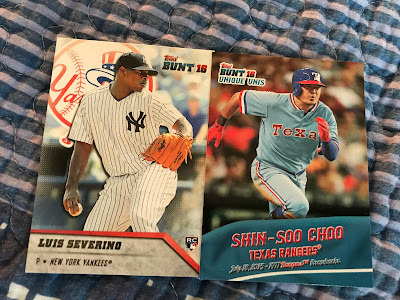 At least this pack wasn't short on Yankees. So...that was definitely something. Still not in love with the set, but it has its moments. ...Yeah, I would have called something like this. Dodgers-Astros. Not necessarily a bad thing. I just wouldn't have called the route we took to get there. I wouldn't have called how unlikely of a choice this matchup would have been. 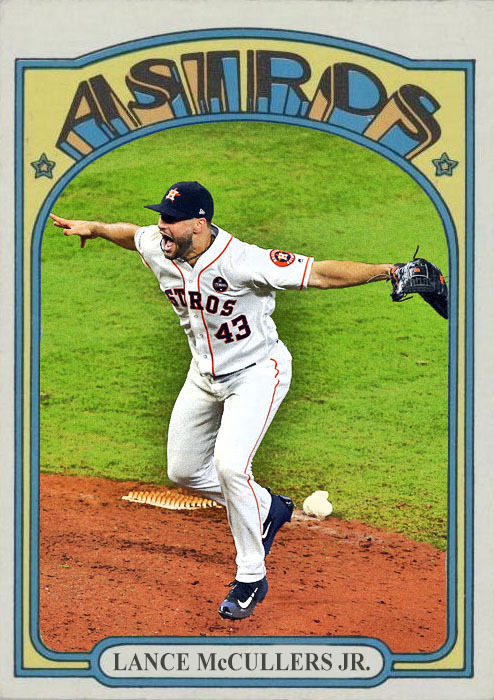 But still, with the amount Evan Gattis and Jose Altuve were able to take us, and the dominance displayed by a rejuvenated Justin Verlander, it's pretty obvious that the Astros deserved to win this series, and...might make this World Series one for the ages. If anybody can take the Dodgers 7 games, it's the Astros. As much as I wanna be a numbskull and brag that this was our year, and say that the Astros had no right...that's not it at all. We had a very lucky October, one that should have ended long before it got going, and the fact that we were able to chase the Astros for 3 games back there is pretty marvelous. 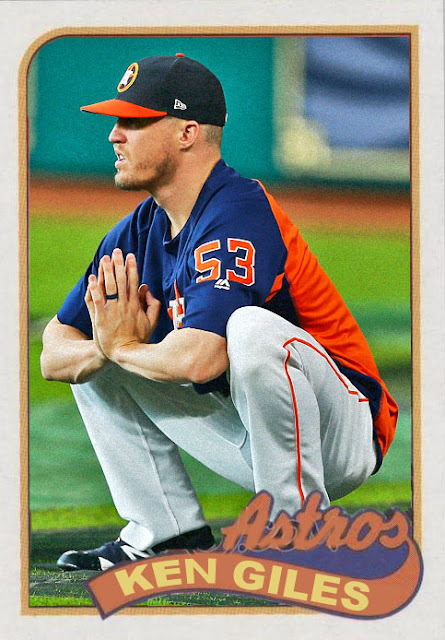 I kinda knew this outcome would happen, as optimistic as I am usually, and I was still perfectly alright with it happening, as the Astros are likable, if still ferocious, team. So yeah...as sad as my Yankees' departure is...we've got an Astros-Dodgers World Series coming up. That's a nice matchup. Especially considering the fact that the Astros have never won a World Series, and haven't been since Roger Clemens was their top ace...and the fact that the Dodgers haven't been to a World Series since Kirk Gibson was their DH. Fun times are ahead. Very, very fun times. I was mad...but not deterred. 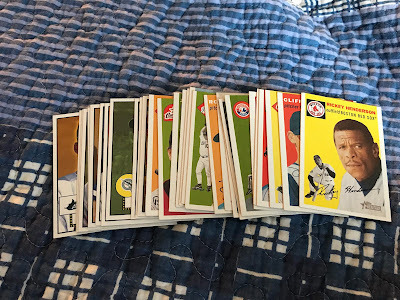 I promised to refrain from dropping 60 or so dollars on a hobby box of a set that had pissed me off by its sheer existence, in not having any cards of trade-deadline dealt stars, and having weird specifications for rookies. This set isn't really updating people on the year, they're just updating themselves on solvable mistakes they made with their first two flagship releases. Today, they had some in Target...and I got some. Mainly because this might be all I get of the stuff all year, and I wanted to just get it all out of my system at once. I got 3 rack packs and a hanger box. I'll reveal the hanger box tomorrow, and today I'll bust the rack packs. 167- Drew Smyley. Why do people still think this guy is good??? 228- Wade Davis. At long last, someone who's relevant this year. 126- Austin Slater, who had a good enough debut in SanFran. 182- Jaime Garcia. Again, this is TWO TEAMS AGO for him. 25- Christian Arroyo. 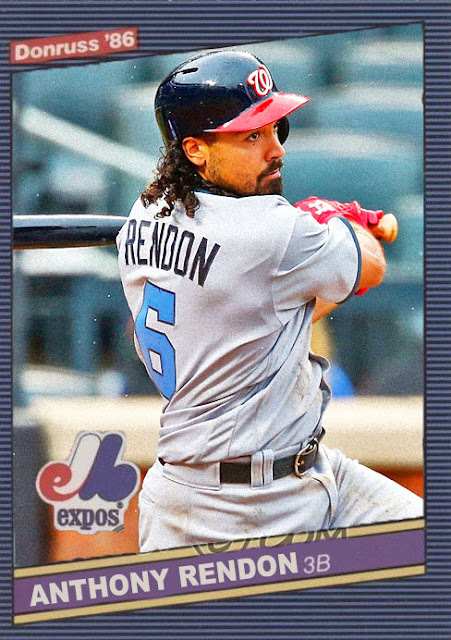 Another prospect that didn't fare well in 2017. 204- Chris Heston, who's probably not gonna be trusted with a starting spot anytime soon. 109- Ben Revere. Marginally better year, but still worrying. 600- Yoenis Cespedes PHOTO VARIATION. Not a bad one, either. Untouchables Insert of Roger Clemens. Wonder why he's untouchable..
174- Brandon Moss, who had a less than perfect season in KC. 168- Michael Conforto AS. Nice photo, there. 55- Luis Severino AS. Hell of a season, Sevy. Rooting for you tonight. 1- AARON JUDGE AS. 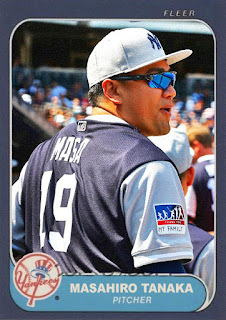 Yeah, even as a Yankee fan, I'm still happy to get cards of this guy. 281- Luke Volt, one of the many pesky Cardinals infielders from this year. 127- Antonio Senzatela, one of the more prominent fireballers for the Rockies this year. 170- Cameron Maybin. I'd say 'now playing for the Astros', but...well, they're not really *PLAYING* him, are they? 29- Drew Streckenrider. I HAVE NOT HEARD OF ANY OF THESE ROOKIES!!!! 184- Jean Segura, looking great in teal. 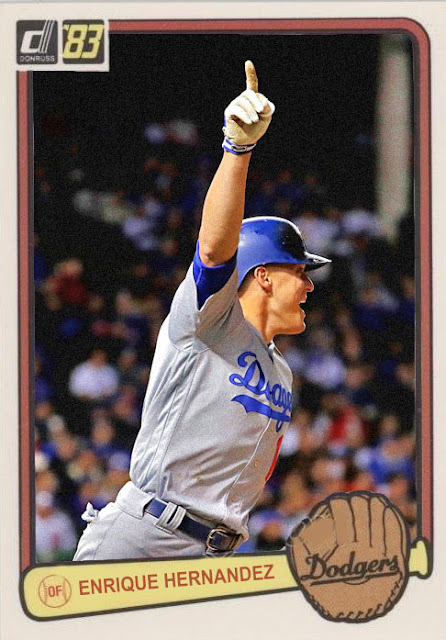 38- Cody Bellinger ASG. THERE'S a rookie I've heard of. 64- Corey Kluber AS. Hopeful Cy Young candidate. 33- Salvador Perez AS. Great hair, too. 214- Cody Bellinger RD. TWOOOOO BELLINGERS, AH-AH-AAAHHHH! 259-....oh, crap, this is a LOU GEHRIG VARIATION SP! This is pretty freaking awesome, especially for the Yankees fan. Untouchables of...Roger...Clemens. I JUST GOT THAT ONE, THOUGH. This version has him on the Yankees. 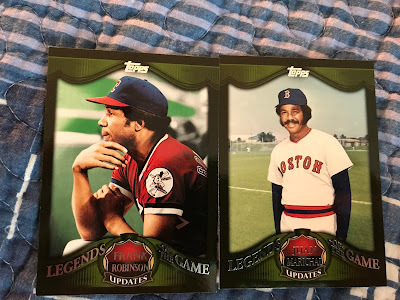 Did this insert set really need 2 Roger Clemenses??? AND DID I HAVE TO PULL BOTH OF THEM???? 42- Seth Smith...PINK PARALLEL...NUMBERED TO 50. HOLY CRAP. A relevant player for a team I enjoy...and a pretty low number. This is awesome. DISCOVER TOPPS BUYBACK OF...A 1988 Harold Baines. I have like a dozen of these at home. 81- Clay Buchholz. Hey, remember when people thought THIS deal would go well??? 57- Blue Jays combo ft. a dabbing Roberto Osuna. Uuuuuggghhhh. 60- Kyle Freeland, another rookie Rockie. 15- Kyle Higashioka. WE...DID NOT...NEED A CARD OF HIM. He never even got a HIT. 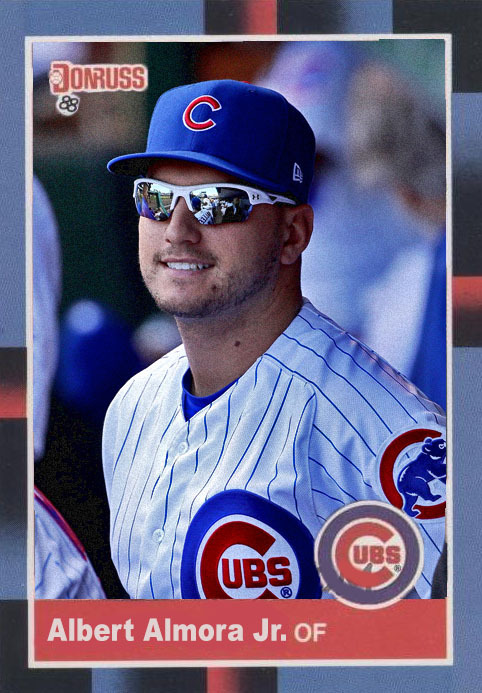 10-....IAN HAPP ROOKIE CARD. OKAY THEN. 217- HOWIE KENDRICK AS A PHILLIE. Even if it was short-lived, I'm happy this card exists. 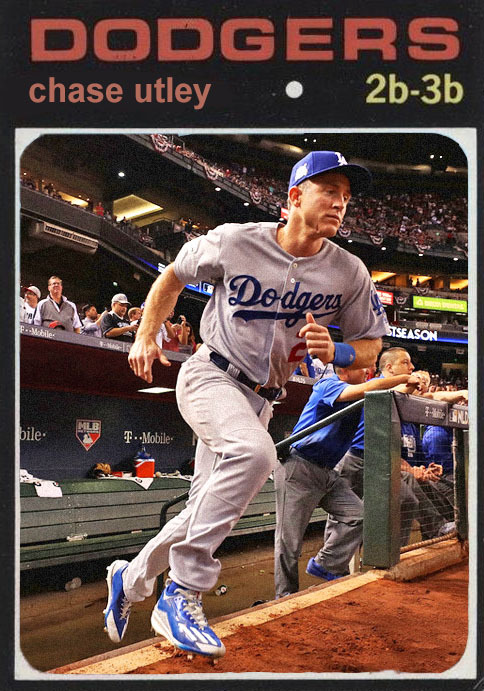 50- CODY BELLINGER RC. ALRIGHT THEN. THIS IS NICE. 4- Matt Chapman, who had an AWESOME rookie season. 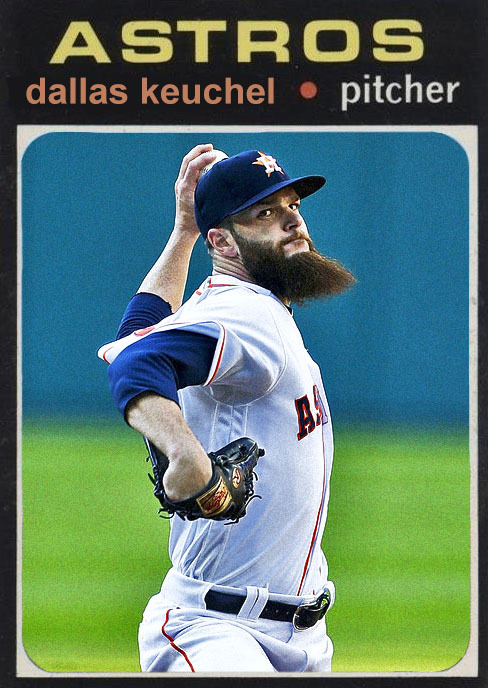 132- Dallas Keuchel AS and his epic comeback...just, like, not against the Yankees. 43- Joey Votto AS, still one of the best 1st Baseman in the game, even 10 years after his debut. 36- Adam Lind, who did well as a bench player for Washington. So, those were some rack packs. I just got a bit tired towards the end. Tomorrow, I'll post the hanger box. For a team that's been in the conversation a TON in the last 30 years, it's honestly kind of weird that it took them that amount of time to get back to a World Series. Plus, this is a new kind of Dodgers team, steeped in youth, rather than established dynasties. There is a Hershiser-esque figure in the rotation, and there are similar pillars of postseason success (Utley is the new Kirk Gibson? ), but this is still a ferocious Dodgers team, one that EARNED its spot in the World Series, even after a September drought. Whoever's gonna have to play them next week...goooood luck. 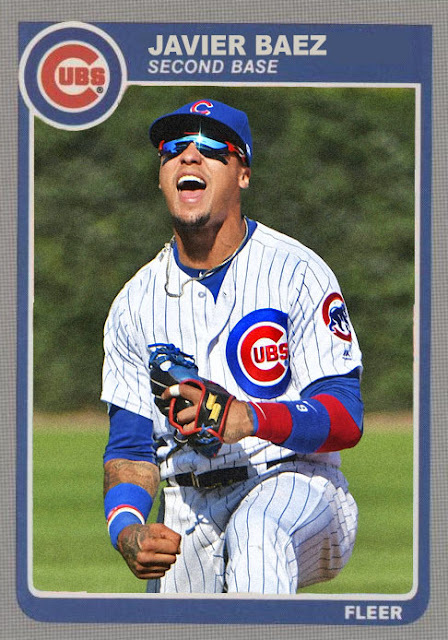 It's sad that the Cubs couldn't muster any of their 2016 energy in this series, but for a team that was counted out for simply not being as good as last year, they came a long way, got to another NLCS against the odds, and hustled when they could have coasted. They put in effort in a year where they didn't have to, and that may help them fare better in 2018. I also hope this means Kyle Schwarber is gonna get back to hitting for average one of these days. Tomorrow night, in Houston...hopefully we get to find out who the Dodgers are gonna be playing. 3-2 headed back to Houston. I don't think anybody expected the Yankees to come this far. Judge and Sanchez have come alive, even bashing on Dallas Keuchel. Masahiro Tanaka had another fantastic postseason start. The arsenal of guys like Greg Bird, Tommy Kahnle and Chase Headley is beginning to work out in droves, as well. If we win Friday night, the Yankees go to the World Series for the first time since 2009, and the Astros will have to limp home on a year the Series was basically theirs. Obviously I'm rooting for the Yankees, but either story would be cool. The Cubs won a game, yes, we all kind of saw that coming...but on a game when the Dodgers essentially had things in the bag, there was power from Javier Baez and Willson Contreras, and a nice start from Jake Arrieta. The Dodgers are going to need to end this tonight, and with Kershaw on the mound, they should hope to, unless they'd prefer to hear sportswriters bitching about it for the next few months. Tonight, we may get a resolution, or we may get another underdog story. Let's see what we're getting. I don't get a ton of opportunities to write about the industry anymore, because, to be honest, I haven't had reason to. How's everything card-wise been this year? Fine. Flagship's fine, Stadium Club's amazing as usual, Heritage is fine, etc. Nothing has really warranted an angry ranting post from me. I'd heard a few complaints this week about the 2017 Update Series checklist, mainly people like Chris Taylor that had missed the cut, which is already pretty ballsy. 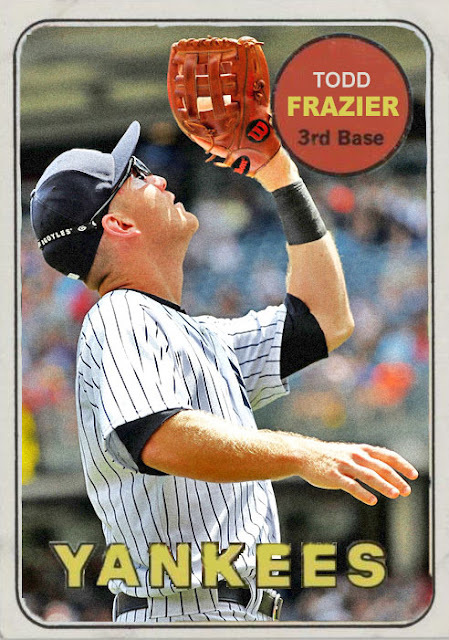 So today, I checked to see which Yankees had made the cut, after Todd Frazier's fantastic night last night. No Sonny Gray. No Jaime Garcia. Hell, Jaime Garcia is listed with the Braves, which is three teams ago for him at this point. I looked around. 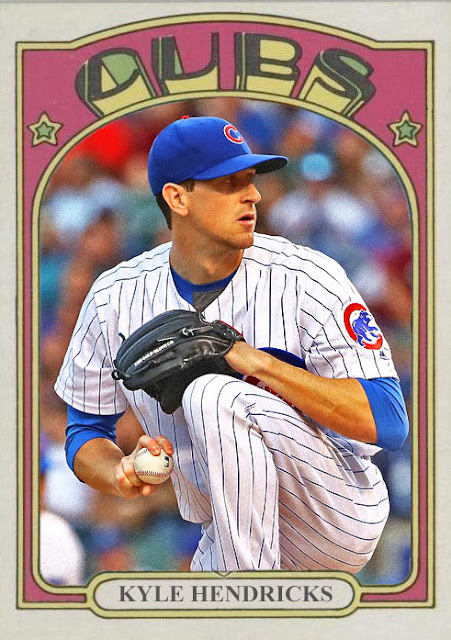 None of the players dealt at the trade deadline had any cards in Topps Update. Not even as short-prints or anything. Only Jose Quintana, who was traded a few weeks before the deadline, had Update Series presence. No one else. 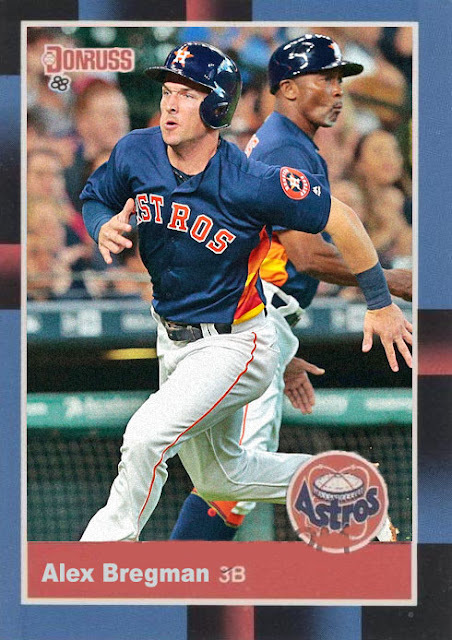 The rest of the checklist was made up of new uniforms for people that had been in the FLAGSHIP set, as well as a ton of rookies (like Kyle Higashioka and Lewis Brinson) that did nothing this year. Now...back in the day, you could account for January and Offseason moves, you know, IN the flagship set. 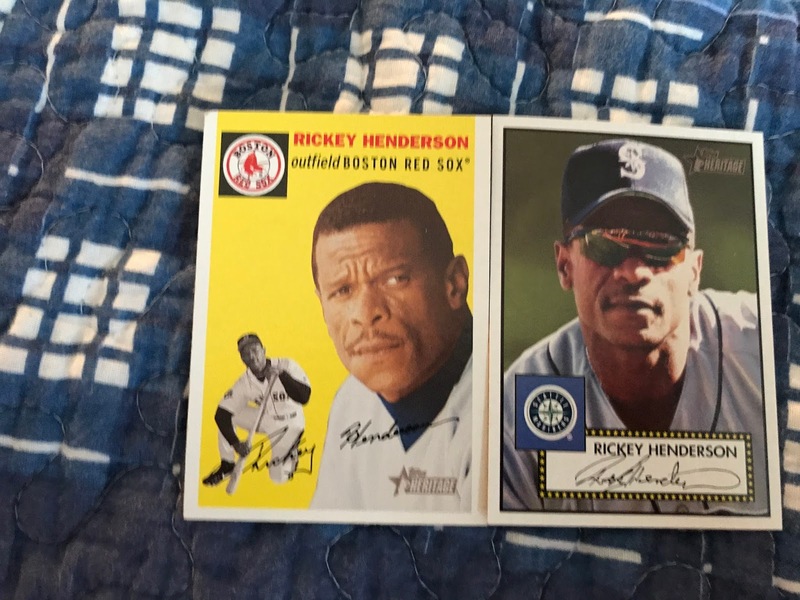 I understand how printing dates work, I understand when checklists need to be finalized, but if you're working on photos and backs for a player that has already been traded to a new team, why can't you do anything to grab a Spring Training photo or make an airbrushing (which are more impressive now)? It's not like the graphic designers are powerless. Look, in 2009, Topps Series 2 had a TON of spring training photos of established players in new uniforms, guys that had been traded in the offseason. Trevor Hoffman, Nick Swisher, Willy Taveras, Jeff Suppan. 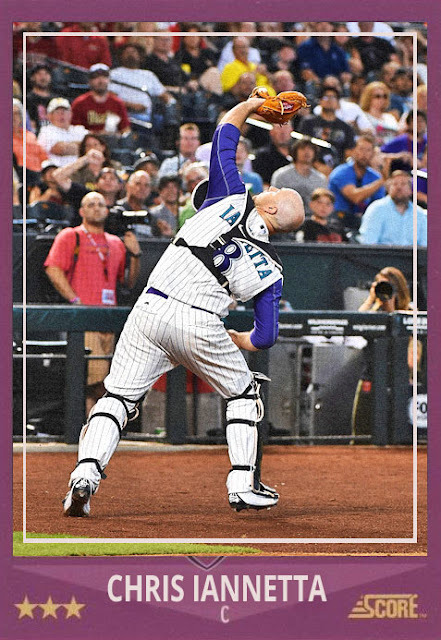 Plus, when Stadium Club hits shelves, it has all the new uniforms, all the Spring Training shots. Stadium Club comes out a month after Series 2- there can't be a transfer of divisions or photos in that time? What I'm trying to say is that all of this could have been avoided. We could have had half of the cards of January guys in new uniforms that are in Update Series...in SERIES 2. If somebody in Series 1 has been traded, and you don't have a new photo of them...save their card for Series 2! Move somebody from S2 up, somebody that won't be traded! This isn't rocket science! Which brings me to the second dilemma- the whole point of Update Series, from the BEGINNING, has been to showcase the results of trade deadline deals, so kids and collectors can see their recently-traded heroes as the playoffs are going on. If Todd Frazier is still in the playoffs, kids want to see him on a Topps card! This year, they friggin' can't! And it's mainly because the print date/checklist finalization date was WAY too early. There's no excuse. The trade deadline was later last year and they still got all the traded players in Update. Now, with an earlier trade deadline, and a WAY EARLIER finalization date...we have next to nothing. Because of deadlines and product-rushing, we have a product that essentially means nothing. 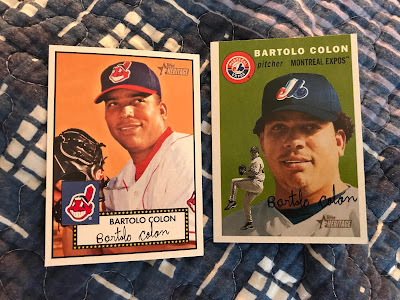 I say this because ten years ago, my first year as a collector, I rushed to the shelves to pick up Update, and saw players I had no idea were traded, like Mark Teixeira as a Brave, or Sammy Sosa as a Ranger, or Kenny Lofton as an Indian again. It was fun to keep track of, especially as Lofton and a few others were in the playoffs. Plus, as trade-deadline deals got more important, the Update series got more stuffed and more filled with traded stars. Now...we don't have any of that at all. The sole reason I had to collect the product 10 years ago is gone, because they wanted to make an EFFICIENT product, not a TIMELY one. I'm gonna have to wait until 2018 Topps to see most of these players in new uniforms, and half of them by THAT point will have already been traded, starting the entire cycle anew again. The bottom line here is that there is definitely a problem, and Topps either doesn't know how to solve it, or KNOWS how to solve it and doesn't want to do the work necessary to. 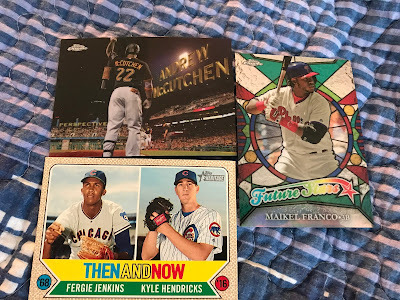 The last few years I've gotten a hobby box of Update. Not doing that this year. Might get a blaster or something. Labels: 2017, allow me to explain why this pisses me off, Jordan is mad today, Ranting, Topps, Update, use your brains for crying out loud, who exactly thought this was a good decision? Playoffs Update: 1978 Rematch Looming Edition? The Yanks have evened the series, behind a MARGINALLY BETTER Sonny Gray performance, with some help from Frazier, Sanchez and Judge. Tomorrow's Game 5, another Yankee Stadium performance, where they'll rally behind Masahiro Tanaka against Dallas Keuchel to hopefully continue the streak of fantastic performances and...not lead to a disappointing trip back from Houston. Are we back to 2015 with a sweep of the Cubs? 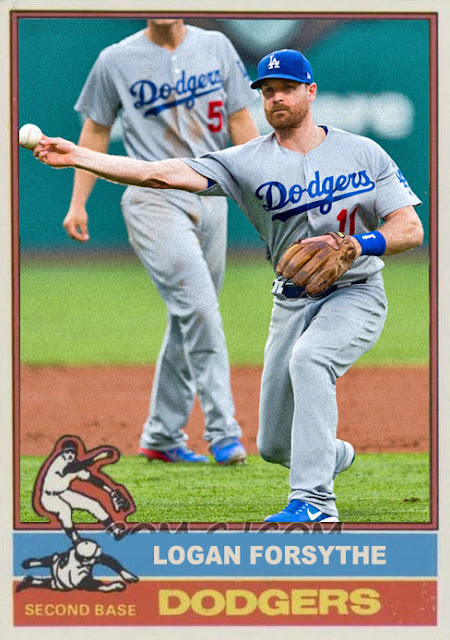 I mean, as great as the Cubs have been to root for, the Dodgers are making this pretty damned easy, with some more work from Chris Taylor and Austin Barnes to give a 3-0 lead with at least one more game to play in Chicago. Unless the Cubs can really spark some momentum tomorrow, we're looking at a World Series in Chavez Ravine for the first time since 1988. Which...actually might be cool, no matter who wins in the AL. More exciting stuff tomorrow. Hoping for some 1978-esque outcomes. Astros up 2-0. Yeah, despite the potency of my Yankees, can't say I didn't see it coming. I mean, sometimes in the playoffs, being the better team actually works out well for you. The Astros had been incredible since, like, April, and the Yankees had moments of humanity...and a few of them have been happening in Games 1 and 2. It's not even the starting pitching, though losing Severino could be pretty horrifying. There's not run support, and the Astros are just able to get through the cracks. 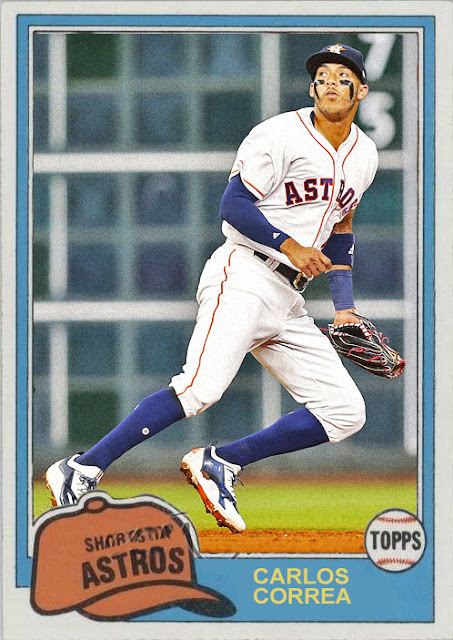 Carlos Correa had a great game last night, fueling both his team's runs. They're in the Bronx on Monday night, and that should probably fuel some sort of a comeback? ...Remind me again why this guy isn't in friggin' Update series?? I mean it. Chris Taylor came in in a big way for the Dodgers. He may not have been as showy as someone like Cody Bellinger, but he could play multiple positions, and he was hitting over .300 for most of the season. 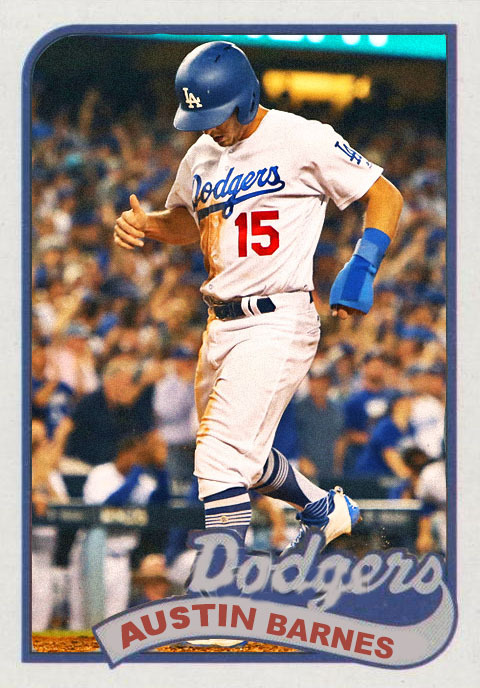 Putting Chris Taylor in the playoffs was a scary idea for competitors, and last night he, Yasiel Puig and Charlie Culberson were battering down the Cubs. It was a surprisingly close game thanks to Albert Almora, but the Dodgers pulled it out behind a FINALLY-PLAYOFF-DOMINANT Clayton Kershaw. Tonight, they play Rich Hill against Jon Lester. Ten years ago, Lester was pitching in the World Series, and Hill was pitching for the Cubs. How time flies. Yankees-Astros ALCS. You know, as vain as I am, I would have never called that in April. I would have said something silly like Astros-Indians. I remember the Yanks-Astros matchups during the season being pretty evenly matched, and I imagine this one's gonna be no exception. I'm expecting Hinch to reach into the rotation and use Collin McHugh and Lance McCullers in addition to the surprisingly awesome blockade of Keuchel-Verlander-Peacock-Morton. They have depth, and they'll use it. The Yankees, meanwhile, are gonna batter these guys done with their core four starters (Tanaka, Gray, Severino and Sabathia), with maaaayyyybe an appearance from Jordan Montgomery? Either way, I'm excited, and, like the Indians-Yanks series, I'm perfectly fine with either team winning, though, of course, I'd prefer it to be the Yankees. Also excited to see how the NLCS rolls out, though I'm guessing the winner will be the team that didn't have an airborne sickness go around their club airplane. That...wasn't the outcome I was expecting, but...I guess this is happening again. Dodgers-Cubs NLCS, round 2. The Cubs, as they do, managed to sneak through, not with an obvious assault but with some surprise attacks. After a year of being out in front, the Cubs got their biggest wins when nobody expected them to, and tonight was no exception- this could have been a game that ended after Michael Taylor's big move, but the Cubs fought back, and made it into the NLCS for the THIRD...THIRD YEAR IN A ROW. That is some Philadelphia-esque stuff right there. And, as for the departed.. I...I don't know what the problem is. I have no idea why the Washington Nationals can't win an NLDS. I have NO IDEA why this keeps happening. They've had consistently great teams, with great performances, and not a ton of changes. They deserve to get there, and this year they deserved to win, and...somehow...they STILL couldn't make it through. What is the meaning of this? Is there a curse? Is this a Montreal thing still? Still, they had a great season, and should not be discouraged. Knowing the Nationals, they'll probably be a few steps down in 2018 but be back in full force in 2019, as they go by an every-other-year strategy (sort of like Cam Newton). So, the matches are set, and tomorrow night...showdown in Houston. I can't wait. I don't know how we did it, but...we did it. The Yankees are heading to an ALCS that was, to be honest, reserved for the Indians. We pulled it off in five games, chasing the most dangerous lineup in baseball, and hitting off of a guy who might win his 2nd Cy Young this year. 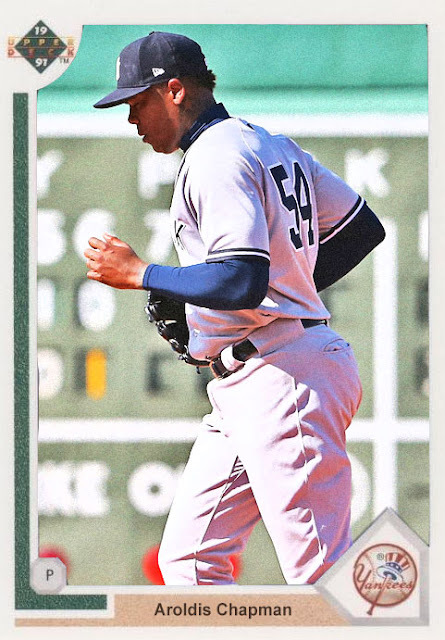 Even better, as they got weaker, we got stronger- Didi Gregorius got even better, CC Sabathia improved, and Aroldis Chapman FINALLY earned his place as a Yankee closer. Still, we do have to pay respects to the departed. I thought the Indians had it this year. I legitimately thought the Series was theirs to win. And the ironic part is that it was my own team that illuminated their biggest flaws. They had an amazing year, with several star players and even more of a foundation for 2018. Still, a Yankees-Astros ALCS. That has a nice ring to it. How about THIS GUY finally becoming a terrific postseason pitcher?? Stephen Strasburg singlehandedly saved his team, with an amazing performance, completely stopping the Cubs from taking the series and forcing a Game 5, back in Washington. The series is getting more and more even, but tonight's game could be an indicator that it may not be as similar as the Cubs thought. Interesting to see how it rolls out in Game 5. The first hurdle has been passed, and the Houston Astros are officially the team to beat in the AL. The Indians, in this series with New York, have proved that they're relatively human, and they can be beaten. The Sox only chased Houston one game, and the Astros still managed to eliminate them, by being two steps ahead and as powerful as they've been all year. It'll be interesting to see how they take on either the Yankees or Indians. Sad to say, the Sox never really had a chance. They were the odd men out, the third option of two vastly superior division leaders, and they would have been eliminated no matter who they played. 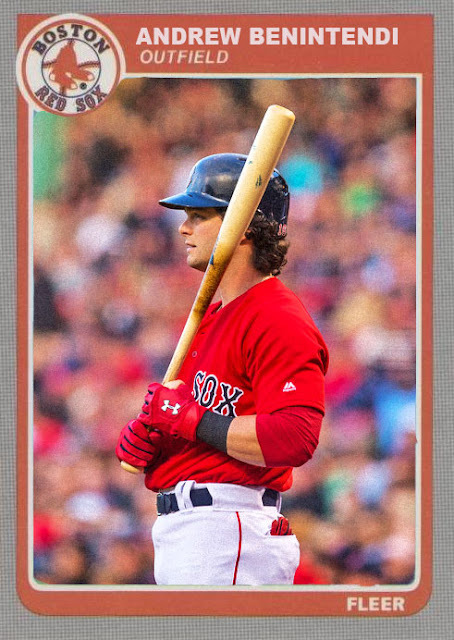 They put up a good fight, and Andrew Benintendi had a nice run at things yesterday, but in the end it boiled down to the same thing it boiled down to last year...they don't have near enough to compete. People are saying there was no doubt that this could happen. Well, I had doubts. If you'll recall, I predicted the Diamondbacks to beat the Dodgers so badly they'd be catapulted into the World Series. Looking back on this three game sweep, I should have been a bit more optimistic in the Dodgers' abilities, and less reliant on that big slump they had towards the end. They've definitely still got it, and the pitching, even with Clayton Kershaw giving up home runs, is shutting them all down. It's looking like this NLCS miiiiiight be a rematch, but I'm thinking whoever they play, they're likely to have the high ground. As powerful as the Diamondbacks could be this season, it turned out to be their own division that did them in, and in a year where three teams wanted desperately to compete, it would have been tough for them to get a word in edgewise, especially with the Dodgers' season. I think people like Paul Goldschmidt, Zack Greinke and David Peralta were definitely able to extend this team's season by a week, and they should be very proud of how far they came...and very concerned, as they're expected to go further next year. First of all, HOW ABOUT THOSE NEW YORK YANKEES? Second game in a row where the odds were against us, and we tore through. It did help that Trevor Bauer was on short rest (which seems to be a theme with him), but people like Greg Bird, Aaron Judge and Todd Frazier have been annihilating the ball, and Luis Severino had an amazing night on the mound. Wednesday night is for all the marbles, and it'll be Corey Kluber, who we...roughed up Friday night, and Sonny Gray, who people also have a tendency to rough up. I'm gonna be hoping for the best, but also...even if the Indians win, I can root for them. They're cool. I think the message I'm getting here is that maybe the Nationals aren't really cut out for the postseason, no matter the year. Either that, or the Cubs have just been getting hot at the right time, as even with Max Scherzer on the mound, Albert Almora and Ben Zobrist went wild, pushing the Cubs over the Nats, and allowing for a lead going into Game 4 today. The Cubs will have Jake Arrieta on the mound. The Nats will have Tanner Roark. At a glance, Arrieta is the safer bet, but you honestly never know. Tonight, we may have a full NLCS matchup. I'll alert you with details if so. Sometimes I forget that one of the more prevalent card shows on the east coast happens literally in my backyard. White Plains, New York, in addition to being A.) unspeakably bland, B.) The nearest town to my college, and C.) Where I buy most of my retail cards, the home of the 'East Coast National', and the semi-annual 'White Plains Sports Card/Memorabilia Show'. This weekend was the 'Fall Classic', a show that took the place of the upper level of the convention center, a basketball court. There was a fairly decent amount of space, and while it wasn't overwhelming, it was a little small for my tastes. I'd like to point out that while I don't normally go straight for game-used cards, there was an ASG patch of Philadelphia hero Cliff Lee for $2, and...yeaaah...they got me. I couldn't resist. 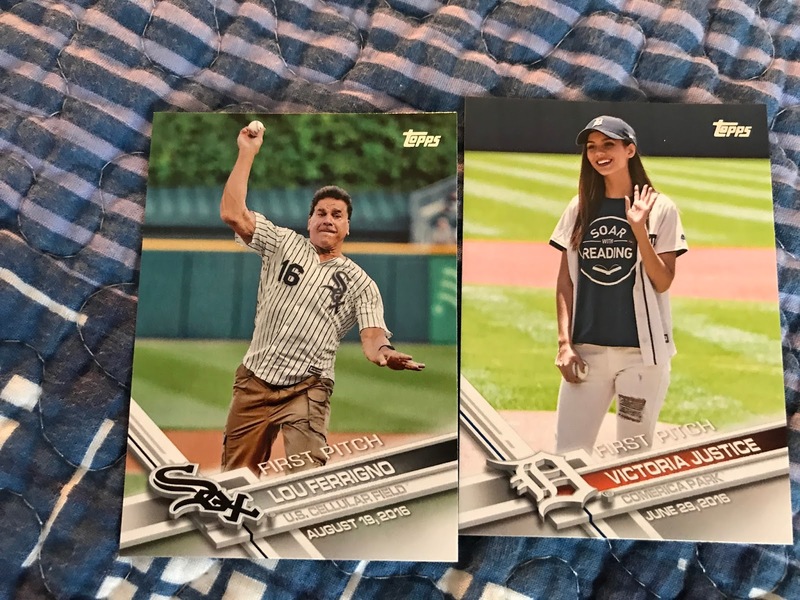 Also, I got the Victoria Justice one because...as a 21 year old, I have a vague idea of who she is, possibly less vague than a ton of other bloggers. Also, as Topps Bunt is slowly becoming one of my guilty pleasures, I grabbed a few of their inserts. One...a base card that snuck in here, of Luis Severino and his prized arm. Another cool one of Shin-Soo Choo in a 70's throwback. More contemporary inserts. The Cutch is a beauty. That one and the Maik are Chrome inserts. I also think it's great they're comparing Fergie to Hendricks, even if I would have went with Jon Lester. Assorted late 00's Starquests. The Price would have gone for, like, 25 bucks in 2009. Glad to see it in my collection for a quarter. Of course, it's really about the 90's inserts, as most of the bins were teaming with them. 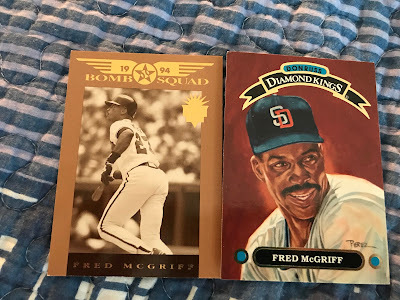 It was honestly a case of what looked cool, and I will NEVER say no to new Fred McGriff cards. It's not possible. 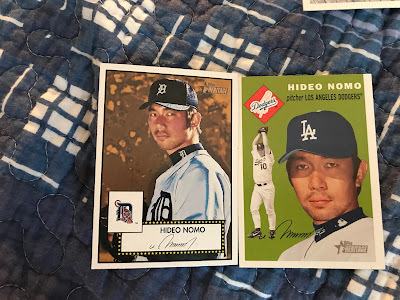 I'd also like to compliment Topps for making Hideo Nomo, another guy I collect, into an Etch-A-Sketch drawing. That's a nice touch. More inserts. The Abreu is a nice Flair one. 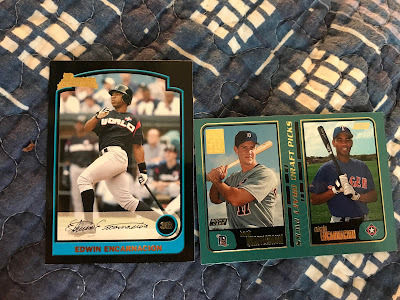 The Guerrero is an ultra-thick Hobby Masters insert that Topps used to do in the early 2000s. Onto more contemporary stuff, the 2009 Update Propaganda set is one of my favorites, and these six have all been knocked off my want-list. Just...look how friggin' cool they are. This was back when Topps actually put effort into making their sets. And, of course, some 2009 Turkey Reds, which I'll never turn down. Only Ibanez has retired out of this bunch, and only CC's still in that uniform. I am amused by pre-dreads Johnny Cueto, though. And some 2010s. Two of these guys are in Texas right now. Also, back in 2010 you would have had to pay way more than 15 cents for a Stephen Strasburg rookie-year card. 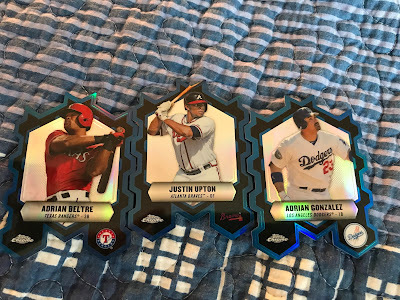 Die-cuts were the theme of one particular 25 cent box, as I nabbed these three Chrome ones. These are cool, as they fit together and such, but not in a polished, triumvirate way. Assorted die-cuts. Two guys I love collecting. This was my favorite of the die-cuts I found. 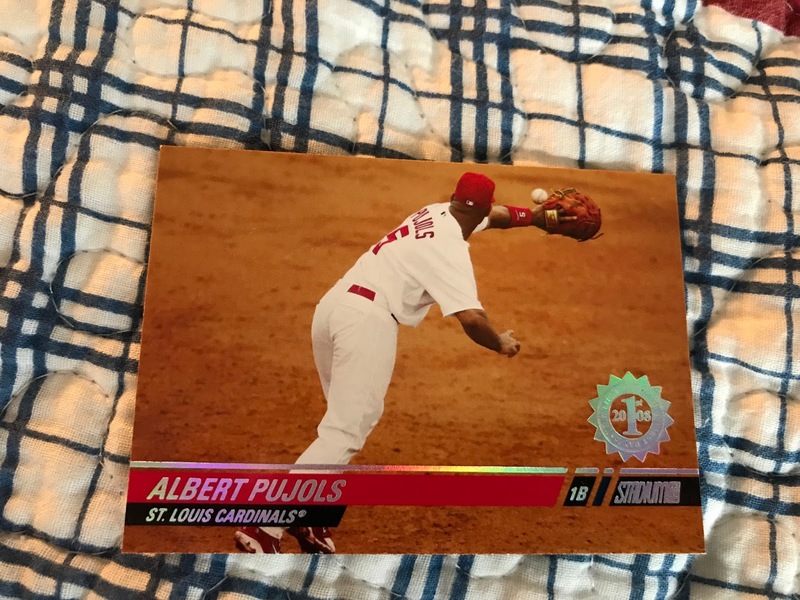 Proof that Fleer actually had some truly inspired ideas before UD bought them. I'll lump these HOF insert-esque things in here. 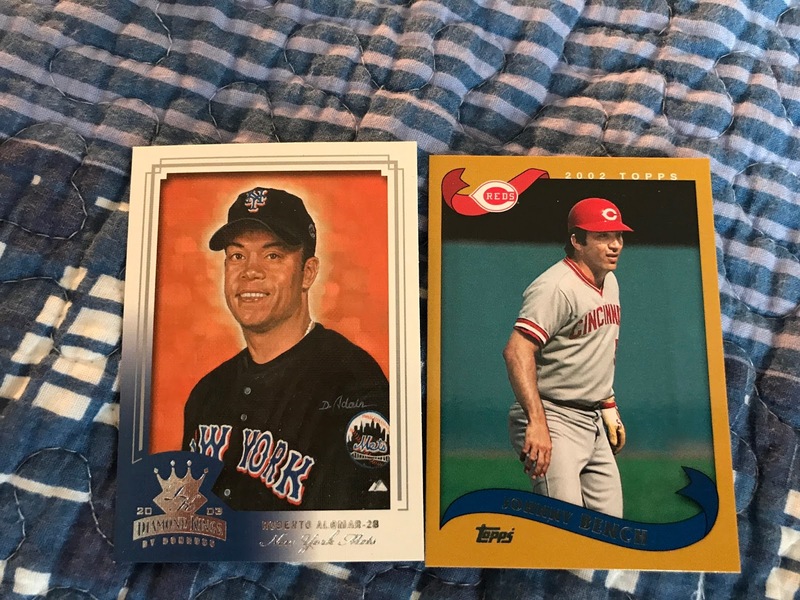 Alomar on a Diamond King, Bench in one of those weird 2010 Topps Legends inserts. Of course, these were always cool when I was growing up. A shame it took me eight years to find these ones, as they're great, and Topps used some rare photos instead of getting the usual ones. 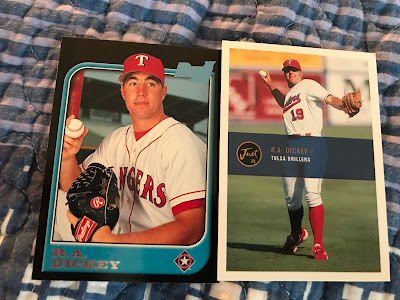 Two of my favorites, because...I don't think these two got many official releases in these uniforms. Or, in Marichal's case, he didn't get a REAL, non-airbrushed one. That look is a BEAUTY. Also, now I can say I have some Retired Signature in my collection, with these three '03 ones. I dig the Goose. 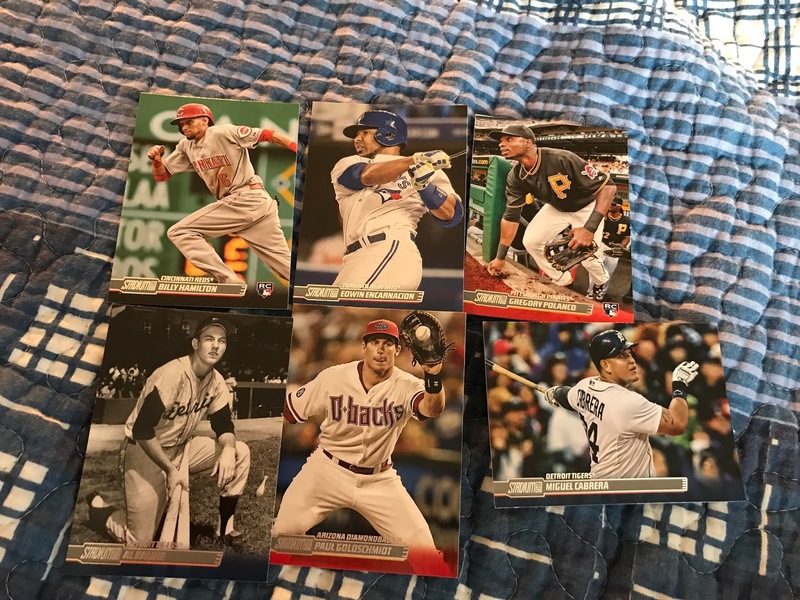 So...that guy who had the 10 cent bins I thought were 25 cent bins...he had MOUNTAINS of 2001-2003 Heritage commons. MOUNTAINS. 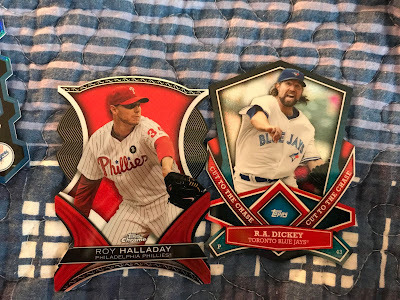 If I'd known they weren't quarter bins, I would have gotten so much more, especially if I would have gone through his 2012-2016 Heritage assortments. I got a ton out of these, but...oh, I could have had more. That whole pile? 3 bucks. These, anywhere else, may have been three bucks each. Late-era Rickey, especially Heritage late-era Rickey, is tough to come by. 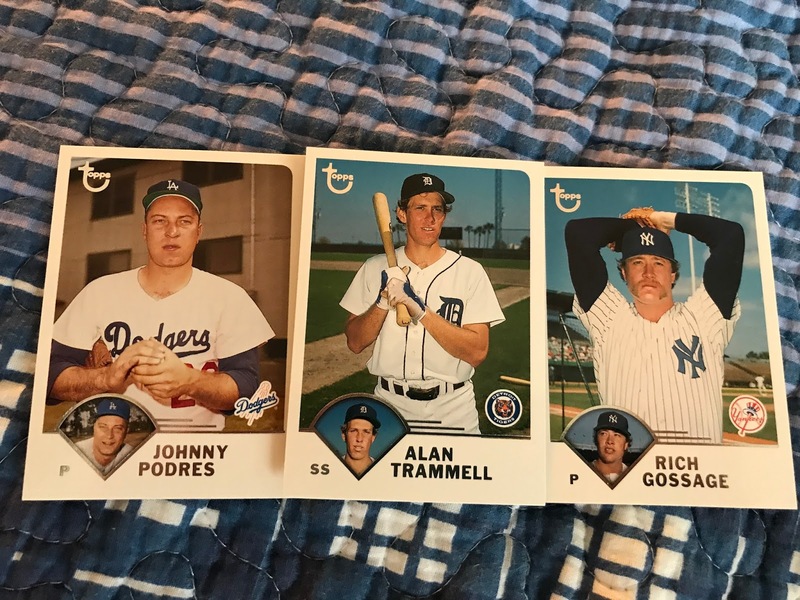 If I had my way, all four of these guys would be Hall of Famers. Next year, Vlad's a definite. Edgar has been getting traction, so he could be next. Roy...I hope I won't have to fight for him. 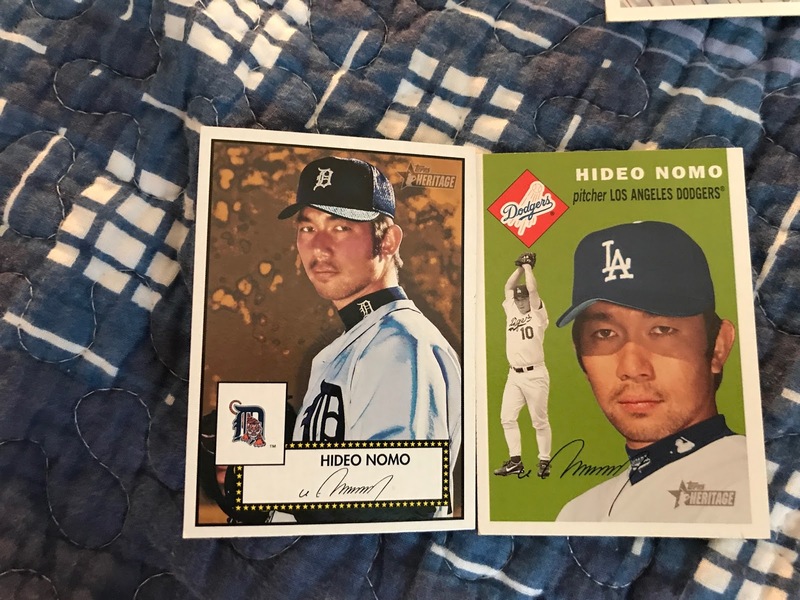 Also, two different eras of Nomo. Various guys I collect. All but Beckett played in Philly. 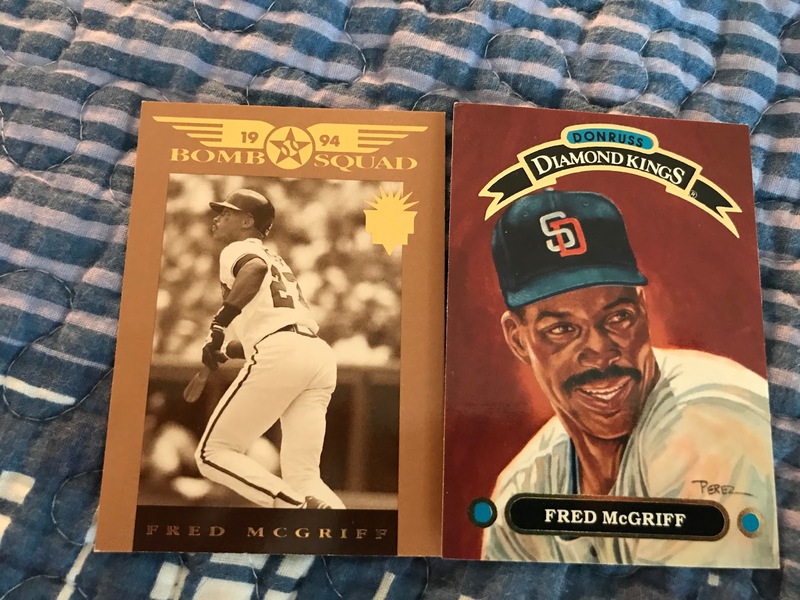 Personal favorites of mine, including (GASP) another McGriff. Throwback to the 2012 Phillies, I guess. Will never stop collecting these three. Never, ever. These guys are all still around! All but Beltre are playing currently! Poor Beltre. As a sidenote, check out that old-school Angels uni Lackey was rocking in...late 2000, I'm guessing. Also, nice to see Chase Utley cards existed in 2003. 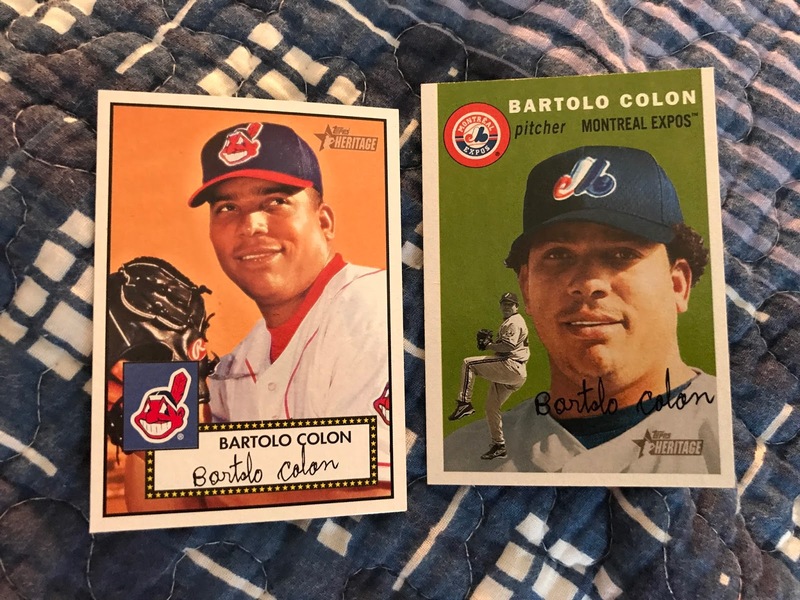 Dueling Bartolos. Nice to come across another Expos issue of his. 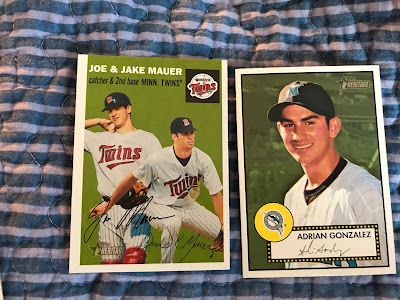 Two MEGA-MOJO cards for a while, each for 10 bucks. I'm still surprised the Mauers one was in there. That one usually goes for a few bucks. The Adrian is great, as that is clearly a minor league uniform with an M on the cap. It's very weird. THESE SEVEN...go toward my goal of finishing the 2014 Stadium Club set. I'm getting sort-of close, especially considering I landed the Hamilton and Marte for 25 each. Kaline's my favorite. I lie...this one is my favorite. They look like the most badass guys in all of sports. Of course there was some 2017 SC, so I partook. Here's a few awesome mound shots. 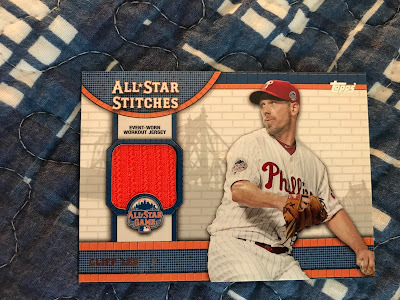 I dig how muted the Hamels is. Studio shots. Desmond's is fantastic, but Mallex' just makes me smile. HOFers. 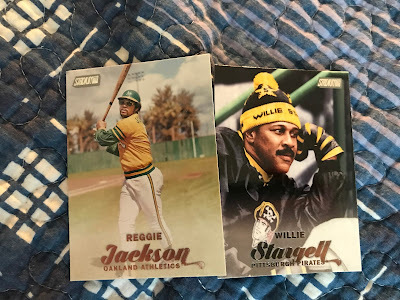 That Stargell is the BEST. Better than last year's. Dugout shots. 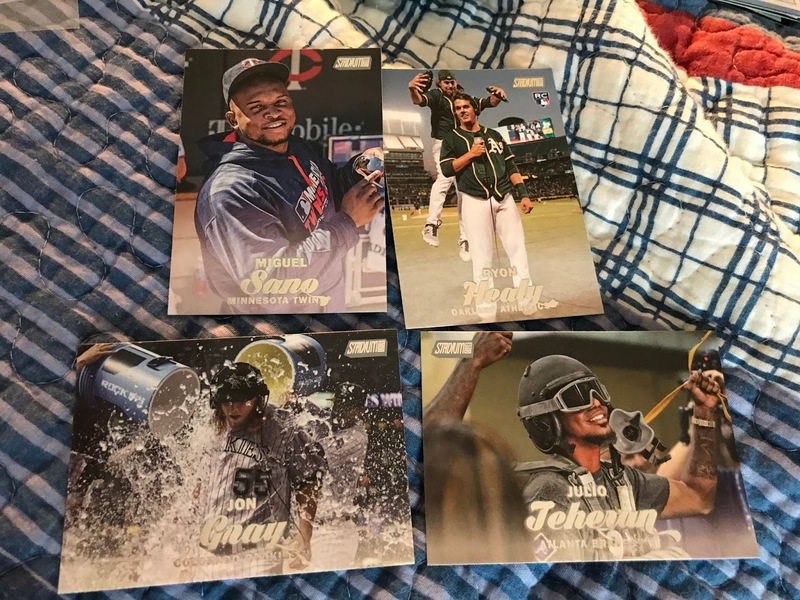 Healy's has already been reported as the best, but Jon Gray and Julio Teheran have some truly fantastic ones as well. My two favorites of the bunch. Evan Longoria with a football...and the most intimidating shot of Joey Votto that's ever been recorded. Not only is this Jean Segura another awesome die-cut, but is a BowChro rookie of his from 2011, though not the ultimate rookie, still a pretty early issue of his. And that was only the cherry on top of the rookies I found at one specific quarter bin. Found these at two different dealers'. These are the two earliest cards of Edwin Encarnation. One, as Edwin never played a game in Texas, is a zero-year card. I...never thought I would land this card for less than five dollars. But...25 cents, again, landed me Aroldis Chapman's official Reds Bowman rookie card. Which is pretty sweet. 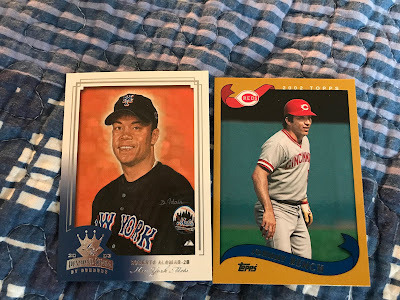 A few more nice ones- Yelich's isn't THE ultimate, but it's an early issue of his. Nova's on the other hand...IS the ultimate rookie, from 2008 Bowman Chrome. Gardy's...is ALSO the ultimate rookie, from Bowman DPP in 2005. This...is Jayson Werth's ultimate rookie. Also for 25 cents. As a Werth fan, I'm pretty proud of this one, as he's likely gonna go maybe one more year before throwing in the towel for good. 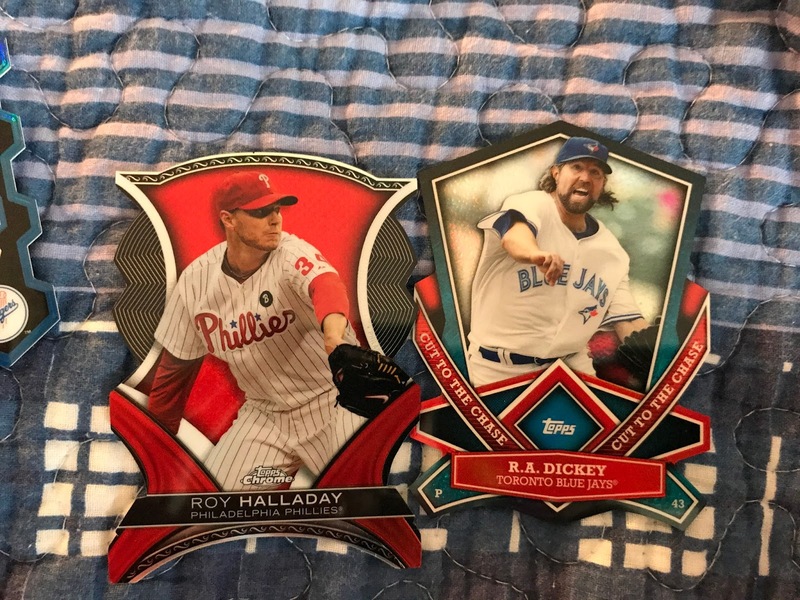 Not one...but TWO R.A. Dickey XRCs. The one on the left I thought I'd only run into on the blogs. 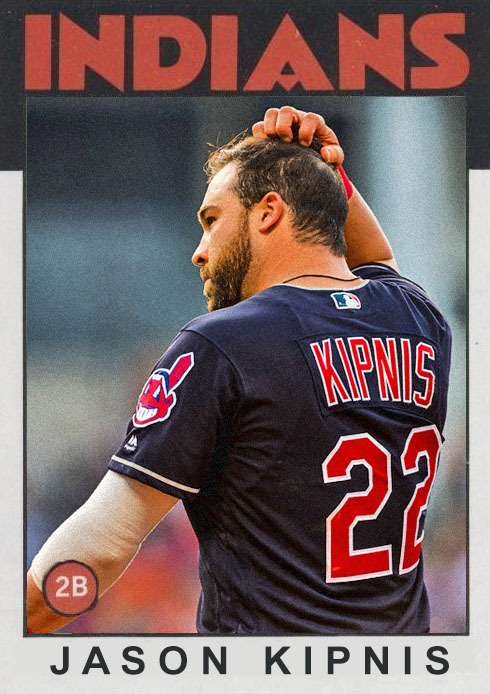 But...having two rookie cards of one of my favorites in the game right now...is a pretty nice feeling. Right next to the Pierre rookie.. So, that's how I did at the White Plains show. Not great, sure...but not too bad, either. Playoffs Update: Where are we now? AL Wild Card: Please Don't Screw This Up, Joe!